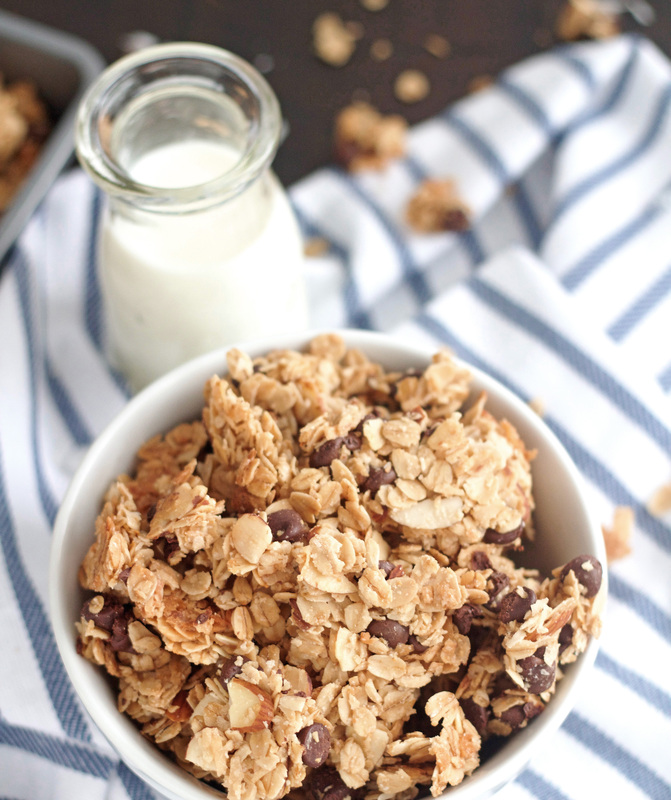 This Coconut Almond Chocolate Chip Granola is so delicious and super addicting. Fabulous in yogurt, milk, on top of ice cream or just to eat alone. The other day I realized my granola container in my pantry had been empty for a few weeks. I’ve clearly been slacking in the granola department, so I got busy and made this Coconut Almond Chocolate Chip Granola. Best. Decision. Ever. I absolutely love making homemade granola. It’s super simple to make and tastes even better than store bought granola, don’t you think? Wow, talk about addicting! We I can’t seem to stop eating this stuff. It’s kind of like an Almond Joy candy bar but in granola form. It’s crunchy, sweet, but not too sweet and soooooo good. I’ve got to be totally honest here, I’m actually eating this by the handfuls as I write this post. See, I told you I can’t stop eating it. 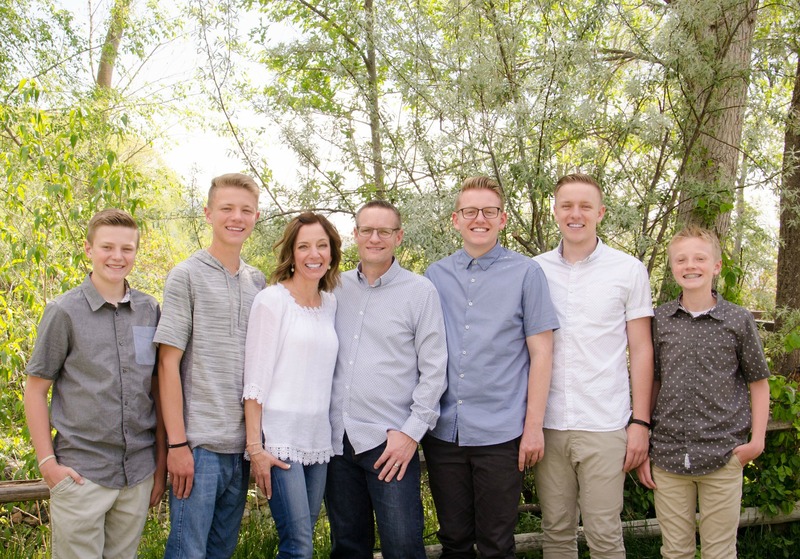 The other night my son Josh and I had some mixed in with Greek Coconut flavored yogurt and holy moly it was AH-MAZING! I had this for breakfast the other day with some almond milk. . . it was totally the perfect breakfast. I wish I would have had almond coconut milk because that would have be truly delicious. Alas, I just had to go with almond milk. Chock full of oats, almonds and coconut, it’s got to be somewhat healthy, right? You certainly could use unsweetened coconut, I just always have sweeneted coconut on hand so that’s what I used. Feel free to swith it up and use coconut oil in place of the canola oil. I would have, but I thought about it too late in the game, so next time I make this I’m using coconut oil. I’ll let you know how it is. 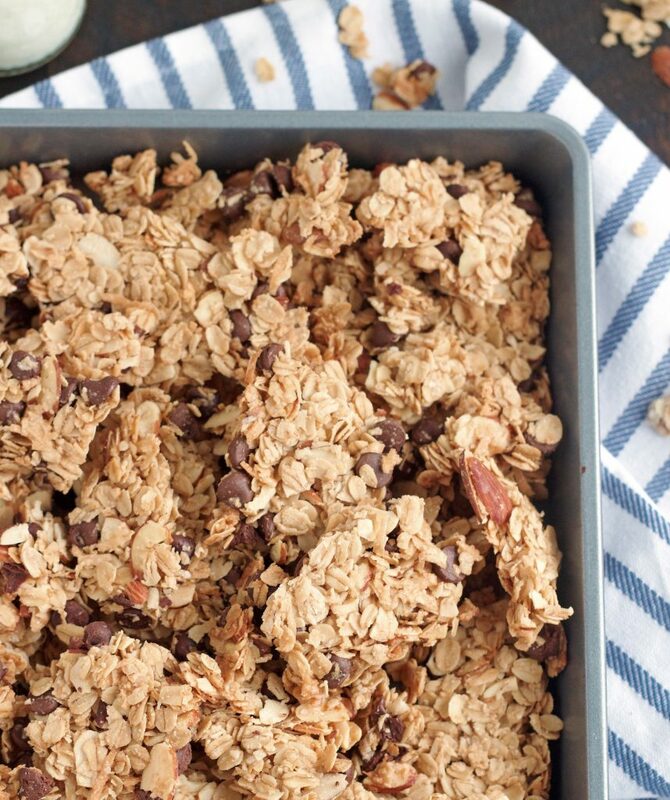 Now go make yourself some granola and try not to eat the entire batch. Whisk maple syrup, sugar, coconut extract, vanilla, and salt together in large bowl. Whisk in oil. 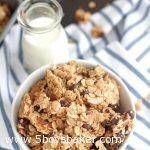 Fold in oats, almonds, coconut and chocolate chips and stir until thoroughly coated. Transfer mixture to prepared baking sheet and spread across sheet into thin, even layer. Using stiff metal spatula, press down firmly on granola until nice and compact. Bake until lightly browned, 40 to 45 minutes, rotating sheet halfway through baking. Remove granola from oven and let cool on wire rack to room temperature, about 1 hour. DO NOT STIR UNTIL IT'S COOLED! Granola can be stored in airtight container for up to 2 weeks.